big ones!). But, golf was an U.S.A. capitalist thing (along with cigars) that needed be purged in socialist Cuba. On August 27, 2010, Cuba announced it will offer 99 year leases on land to foreign investors. This capitalistic action by Cuba portends at least 10 more luxury golf courses in Cuba (currently there are only two...actually three golf courses in Cuba if one counts the golf course at the U.S. Naval base in Guantanamo!). We look for Scottish and Canadian companies to lead the charge into "golf cuba". 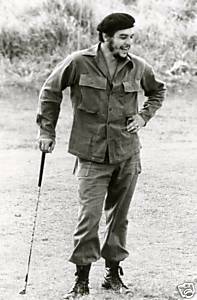 Che playing golf in Cuba immediately before almost all golf courses were bulldozed. 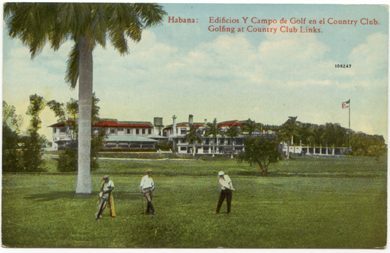 The history of golf in Cuba includes high profile visits by the great players of golf during the 1940s through 1950s. Photos of these international golf celebrities decorated the club houses in Cuba. Golf CUBA© intends to bring to the Internet community (www.golfcuba.com) and general public, through print media, all future developments of golf in Cuba. We do not offer travel to Cuba for recreational activities, at this time, since we are U.S.A. based. Informational items and historical comments and photos will be appreciated for future issues. © Copyright, 1999-2014 Havana Bay Company ® All rights reserved.